I have lots of fun happy stuff to share with you guys! So get ready for some random joyfulness! First, I am SO excited to report that I have redeemed my running self! 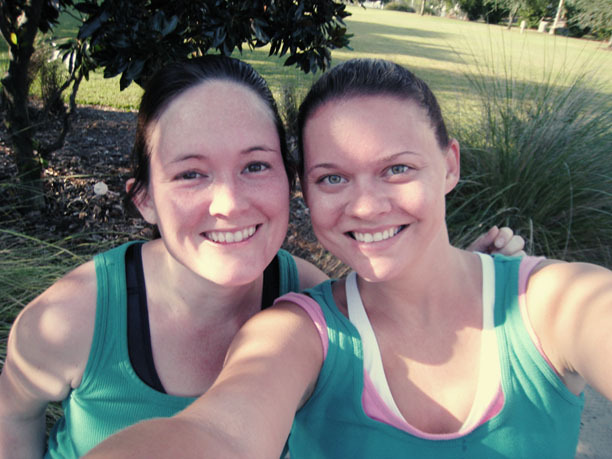 I did another 5k this past Saturday, and this time I had my running partner with me again. I finished in 33:39 this time!! Yeah, buddies! That’s almost FIVE MINUTES better than the weekend before, and two minutes better than my best time this year! 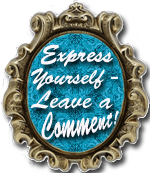 I can’t even write about it without using excessive exclamation points!! But it gets better – Alanna finished right ahead of me and she got a medal! That’s right – she was 3rd in our age division. And this was only her 3rd race, ever. In fact, she was not a runner at all until this year! How awesome is that?! Alanna’s Mom and my awesome MIL both did the race as walkers, and guess what?! Alanna’s Mom got FIRST in her age division for the walkers, and my MIL got 2nd in hers! So everybody got medals except me, which is totally cool because I don’t deserve one yet and also, I won a door prize – a bag full of running goodies. Yahoo!! 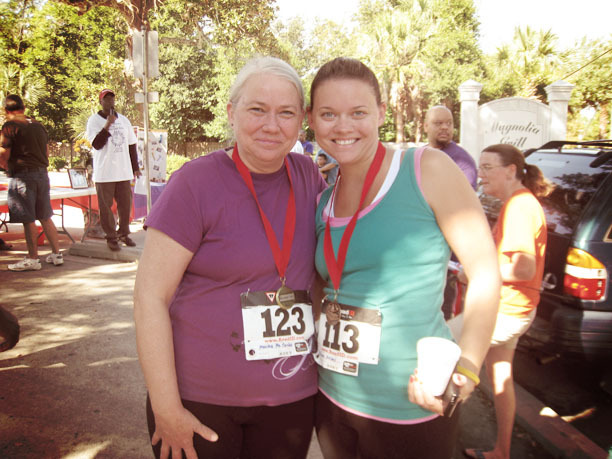 This was such a fun race, and for a great cause, too – More Precious Than Rubies. I think we will all be doing this one again next year! So Excited For These Ladies! Then there’s the horses. I can’t tell you how much I *love* having the horses live a mere 15 minutes away! The peaceful mornings are perfect for my (somewhat) daily devotions, and the evenings are a great way for my whole little family to unwind and enjoy one another. 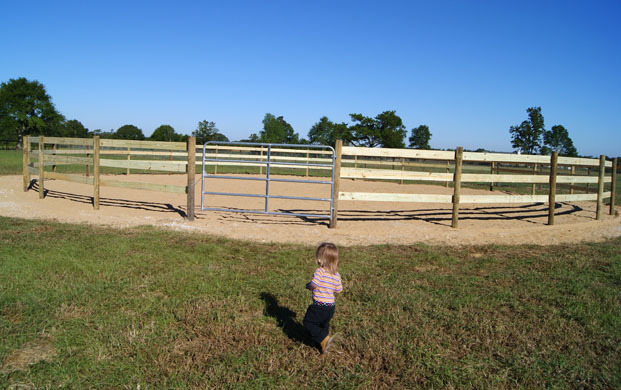 Last weekend my Dad, Brother and Hubs built a round pen for me, so I can finally start saddle breaking my Wunderbar! I am so excited (and a little scared!) to get started with him. I know he’s going to be awesome! But don’t worry, there won’t be any cowboy shenanigans going on…I don’t want any injuries to myself or Wunder, so we’ll be taking things slow and steady. 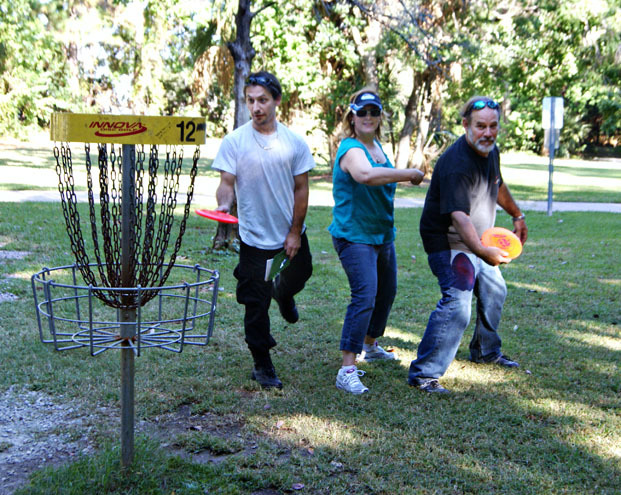 Have you guys ever gone frisbee (aka “disc”) golfing? If not, you should check it out! It’s a fun way to spend a few of these gorgeous fall afternoons. Dave and I went with his parents last weekend, and good times were had by all. I haven’t done much baking, but I did make a dozen monkey pops for my niece’s birthday Sunday. Somehow I managed not to take a single picture of them. Yeah, I don’t know what’s up with that. Tonight I’m making a batch of my favorite cookies from Cookies and Cups – chocolate chip meltaways! YUM! I’m taking them with me to a lunch date tomorrow with a long-lost friend who I haven’t seen in at least ten years. I’ll tell ya all about her later! WAY TO GO!!! You are a rock star girl! What a lovely up-beat post Becki. Your running is awesome and I am happy that you are so happy to have your beloved horses nearby. It’s wonderful that the kids are growing up so near to these beautiful animals. 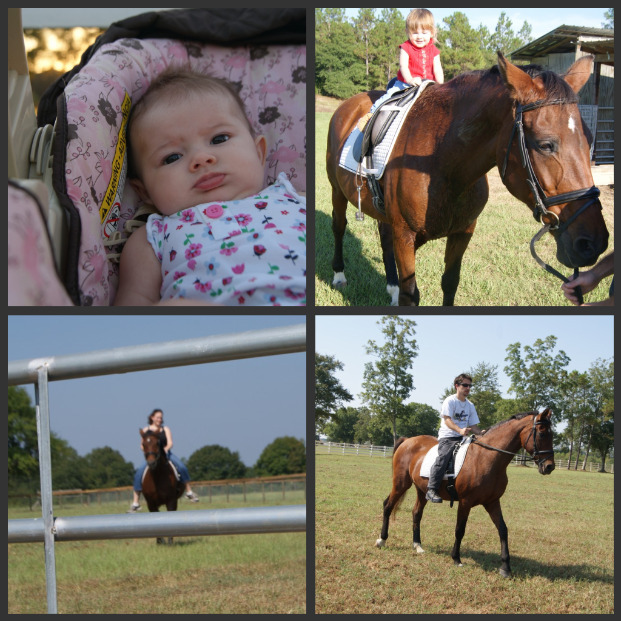 My father loved horses and my daughter used to ride. She said it was magical for her and that everything fell away from here when she rode. Just her and the horse. Can’t wait to hear more about your horses. I keep telling myself that one day I will have a horse and he was famously famous and run at Churchill Downs and I will name him Split Decision. But that’s a fantasy. I’m more likely to own a cat. WHEN ARE WE RACING AGAIN!!! I am super excited and ready to go! Are you doing the 5k on the 30th??? And we also need to get my boys on that horse! Lauren looks like she is having so much fun!!! 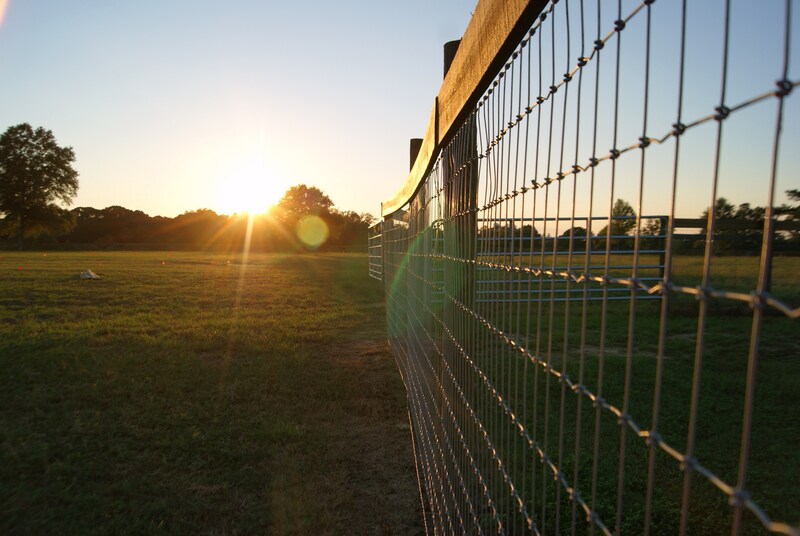 LOVE your round pen! Oooh, I’m green-eyed with envy, that is a thing of beauty. I am so happy for you. Being near your horses is a priceless thing. I think I feel closer to God when I’m on a horse, out in nature than I do when I’m in church. I mean, in church there’s the music, which is wonderful, but outside in nature with the most incredible animal He created, that’s where I really get hit with just how endless and incredible He is. Thanks, Maven! I definitely have a deeper appreciation for the Lord and His amazing love, kindness and creativity when I am out “in nature” with the horses. So much peace, harmony and beauty. Ahhh. Previous post: I Can’t Run For A Cause. Next post: A Cotton-Pickin’ Good Weekend!